Message: Love the show guys. I've seen every episode. Just like the rest of your gear I've watched your choice of sunglasses evolve over time. My question is what lens material/color is best for fishing clear water/muddy water? Blue water and/or inshore? Thanks so much for being a loyal viewer! As you are aware, polarized sun glasses are one of the most important pieces of equipment that a fisherman can have. They not only cut the glare so that you can see into the water far better than with regular sunglasses or without sunglasses, but they also protect your eyes from damage. While there are lenses for special situations available (i.e. low light, Offshore, Inshore, etc..) I like to try to find a pair that will work pretty well in most situations but particularly good on the flats. Each of us is different so my opinion is just that...my opinion. 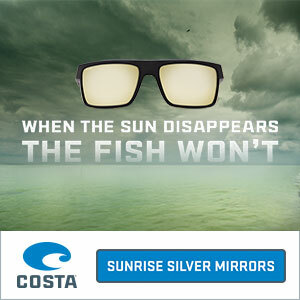 Costa makes Many different lenses that I like but if I am pressed to choosing just one, I would go with a dark amber lens for most of my fishing. Offshore anglers tend to gravitate to a blue tinted lens. Another opinion based choice is the lens material. I am a strong advocate of the plastic lenses, but many prefer glass. Costa makes a 580p plastic lens that is as clear as any glass lens that I have ever seen so I see no disadvantage to going with the plastic. Here's a video on this topic that I made a few years ago. I hope this helps you make your choice. We respect your privacy. We won’t hammer you with emails. Just the goods.